Brakebills students rejoice! SYFY has renewed The Magicians, currently in its third season, for a fourth season of 13 episodes! The series is one of the network’s top shows over the past several seasons. The Magicians is going musical again! Feeling a little Under Pressure? Check this sneak peek for Episode 9 of SYFY’s The Magicians…alas, it doesn’t air for two weeks! But catch Felicia Day again tonight at 9/8c! Find out if the magic is coming back when the students of Brakebills return for Season 3 of The Magicians on January 10th, 2018 at 9/8c on SYFY! We always love it when our friends are announced to appear on new shows! Nerdist today announced in an exclusive that Felicia Day (The Guild, Dr. Horrible’s Sing-Along Blog, etc.) will join the cast of The Magicians in the major role of Poppy. I won’t elaborate so as to avoid spoilers, but we’re excited about this. He didn’t elaborate on the role, but I’m sure we’ll hear soon. Syfy today announced a 13 episode third season pickup of the critically acclaimed Universal Cable Productions drama The Magicians. Hailed as “one of the best shows on TV” by Wired, the series continues to buck industry trends, performing stronger in its second season than its first. To date, Season 2 is up year over year across all key demos (P18-49 +15%, P18-34 +23%, P25-54 +9% and +6% among P2+), and has nearly doubled its freshman run in social engagements across platforms. The sophomore season currently airs Wednesdays at 9/8c on Syfy, and the must-see finale will air Wednesday, April 19. Season 3 of The Magicians will premiere in 2018. Based on Lev Grossman’s bestselling novels, The Magicians centers on Quentin Coldwater (Jason Ralph) and his 20-something friends as they are thrust into the unfamiliar world of the beautifully enchanting yet mysteriously dangerous Fillory – and places beyond – where they must draw upon their novice skills to save the existence of magic. The Magicians stars Ralph, Stella Maeve, Olivia Taylor Dudley, Hale Appleman, Arjun Gupta, Summer Bishil, Rick Worthy and Jade Tailor. The series is executive produced by John McNamara, Sera Gamble, Chris Fisher and Groundswell Productions’ Michael London and Janice Williams. Check out what’s happening on tonight’s penultimate episode! Syfy’s The Magicians are pulling a bit of sophomore magic, with the Season 2 premiere getting double digit gains over the series premiere in the Live+3 ratings, netting a 25% overall increase and 33% higher in the 18-49 demo, and the highest for the channel since 2014. It seems that this show really has caught with audiences as the story has developed. Jason Momoa’s Aquaman has found its villain…Yahya Abdul-Mateen II (Get Down) has signed on to play foe Black Manta in the standalone film, scheduled for an October 2018 release. Teri Hatcher is returning to the Kryptonian world of DC Comics…the former Lois Lane from Lois & Clark: The New Adventures of Superman will join the cast of Supergirl in an unspecified recurring role – but word on the street is that she will become the new Big Bad of the show. 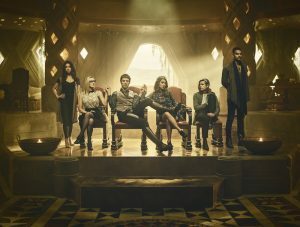 Syfy’s breakout hit The Magicians returns tomorrow night at 9/8c, and the second season is already amping up the magic levels – in order to save the magic. Season 2 begins with with the possible destruction of all magic, and Quentin (Jason Ralph), Alice (Olivia Taylor Dudley), Eliot (Hale Appleman), Margo (Summer Bishil) and Penny (Arjun Gupta) are in Fillory to save it. Fillory, which Quentin thought was just a place from a series of storybooks called “Fillory and Further”, is not only real but is the source of all magic. And to save it, it may mean fulfilling the story and becoming the kings and queens of Fillory. Meanwhile, Julia (Stella Maeve), having become a hedge witch since she was rejected as a student at Brakebills, is teaming up with the Beast (Charles Mesure) in order to get revenge on the trickster Reynard the Fox, and her friendship with Quentin won’t stop her. I don’t think it is a surprise that the students survived the attack by the Beast, although we were left wondering at the end of Season 1 – and it is “resolved” rather quickly. However, this isn’t just a push of a reset button after a cliffhanger – their survival won’t be without issues and consequences that will last through Season 2. So while the show still keeps its whimsical side, it will continue with exploring deep issues, such as Julia’s need for revenge after the being a victim of Reynard’s sexual assaults. It is interesting that the parallels with C.S. Lewis’ world of Narnia continues as well, with Eliot not only having to become High King, but his fellow students also becoming Kings and Queens – two of each, just like the Pevensies in Narnia. This seems to add to the intrigue of the story, however – it is like seeing someone else’s take on the story, being familiar yet different. And we’ll see a deeper side of Eliot while he is in Fillory with new responsibilities. The Magicians, based on the books by Lev Grossman, follows the 20-something students at Brakebills University for Magical Pedagogy, where they discover that magic is hard and the world of fantasy is real.